Global equity markets including the JSE fell on Monday as stocks traded weaker due to the pressure emanating from rising US yields. The drop on Monday was led by the Chinese mainland benchmark which reopened after a week-long holiday to trade significantly lower. The Shanghai Composite Index eventually closed 4.3% lower while the Hang Seng lost 1.39%. The Nikkei was closed for a holiday. 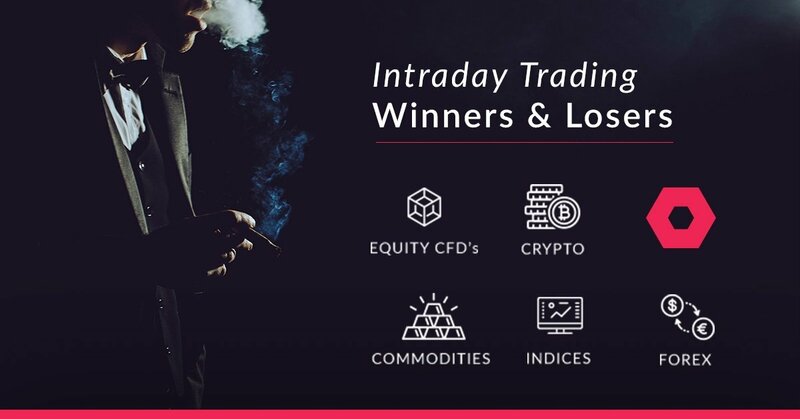 The weaker trend was also recorded across all the major European indices as well as the USA where the Dow Jones and S&P500 indices opened weaker despite positive jobs data released on Friday. On the JSE, directionally the market was trading weaker however there were no significant moves lower amongst the blue-chip index constituents. Richemont [JSE:CFR] was one of the index’s biggest losers after dropping 1.71% to close at R113.32, Remgro also traded softer to end the day 1.17% weaker at R189.00 per share. Retailer, Truworths [JSE:TRU] retraced to close at R81.35 after shedding 2.4%, while Shoprite [JSE:SHP] closed 0.62% weaker at R182.20 per share. Bigger losses were recorded for stocks on the broader All-Share index where South32 [JSE:S32] came under pressure to end the day down 3.79% at R41.65 per share. Anglo American Platinum [JSE:AMS] lost 4.14% to close at R463.00, while Sibanye Stillwater [JSE:SGL] closed 1.62% weaker at R9.70 per share. Stadio Holdings [JSE:SDO] lost 4.24% to close at R4.07, and its industry peer, Curro Holdings [JSE:COH] fell by 5.14% to close at R26.04 per share. 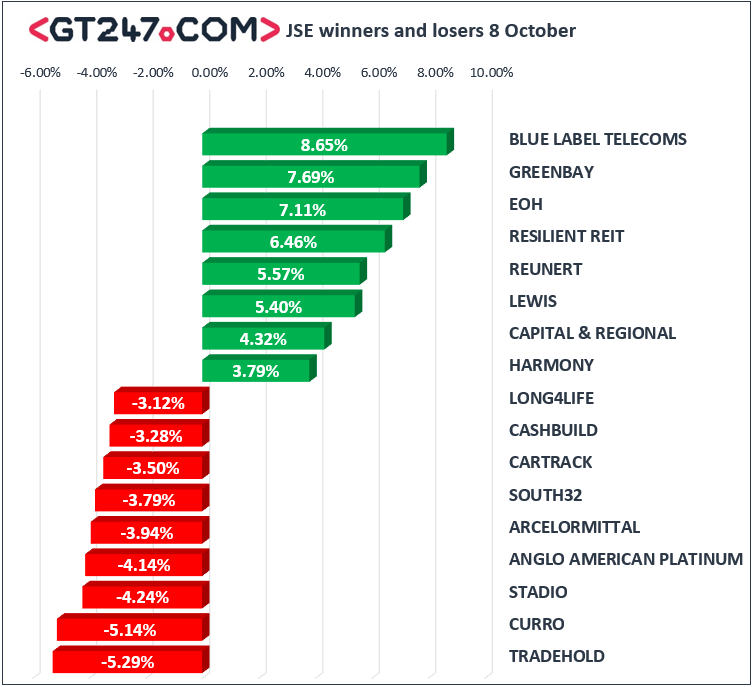 Listed property stocks led the day’s biggest gainers as Resilient [JSE:RES] jumped 6.46% to close at R59.15, Fortress B [JSE:FFB] added 4.19% to close at R15.19, and Greenbay Properties [JSE:GRP] closed up 7.69% at R0.98 per share. EOH Holdings [JSE:EOH] rose 7.11% to close at R34.05, while Reunert [JSE:RLO] closed at R80.51 after gaining 5.57%. On the blue-chip index, Mediclinic [JSE:MEI] firmed by 3.31% to close at R87.95, while MTN Group closed 2.63% higher at R86.00 per share. Retailer, Woolworths [JSE:WHL] posted gains of 2.17% to close at R48.58, and banker, Nedbank [JSE:NED] closed 1.31% firmer at R255.42 per share. The JSE All-Share index eventually closed 0.35% weaker, while the blue-chip JSE Top-40 index shed 0.45%. All the major indices traded under pressure which saw the Resources index drop 0.95%, while the Industrials and Financials indices dropped 0.22% and 0.21% respectively. The rand weakened against the greenback to a session low of R14.98/$ as fears over the South African finance minister’s potential resignation reignited fears into the market. The rand did rebound from those lows to trade at R14.86/$ at the JSE close. Gold traded under pressure as it fell by more than 1.5% to a session low of R1184.24/Oz. At 17.00 CAT, the precious metal was trading 1.47% weaker at $1186.06/Oz, Platinum was down 1.19% to trade at $812.72/Oz and Palladium was down 0.28% to trade at $1068.70/Oz. Brent crude retreated from Friday’s highs as news of continued crude oil supplies from Iran despite US sanctions hit the market. The commodity was down 0.96% to trade at $83.35/barrel just after the JSE close. At 17.00 CAT, Bitcoin was up 1.34% to trade at $6661.10/coin, and Ethereum was 2.84% firmer to trade at $229.33/coin.